One of hard rock's most exciting young acts, SANTA CRUZ, has returned with a new single, “Changing Of Seasons”. The song – which was co-written and produced by Kane Churko (OZZY OSBOURNE, DISTURBED, FIVE FINGER DEATH PUNCH) – is now available for streaming on Spotify, Apple Music, Bandcamp and other digital platforms. A lyric video designed by Rafael Ortega of Ecliptic Visions can be seen below. “Changing Of Seasons” provides the first taste of SANTA CRUZ's new album, which will be released in the fall. The group will celebrate its launch with a performance alongside GUNS N' ROSES at the Louder Than Life festival in Louisville, Kentucky, which takes place from Sept. 27-29. In the months prior, the band has a number of high-profile European shows scheduled, including a German date with WHITESNAKE and several festivals in the group's native Finland. A complete list of the band's upcoming shows appears below, with more to be announced in the coming weeks. “Changing Of Seasons” marks the beginning of an exciting new chapter in the story of SANTA CRUZ, who made impressive waves on both sides of the Atlantic in the five-year period following the release of their acclaimed 2013 debut. In Europe, the group scored two Top 5 albums in their home country, supported the likes of AC/DC and delivered memorable performances at major events such as the UK's Download Festival. In America, meanwhile, the band appeared on the AXS TV program “Breaking Band,” played notable gigs such as Rock On The Range and the inaugural Motörboat cruise and toured alongside I PREVAIL, AMARANTHE and SEBASTIAN BACH. Halfway through an American tour with FOZZY last spring, however, founding member Archie Cruz and his then-bandmates parted ways. Soon after, Archie vowed that “the saga ain't over yet” and temporarily relocated to Las Vegas to write and record the band's new album with Churko at the city's Hideout Recording Studio (IN THIS MOMENT, PAPA ROACH, HALESTORM). 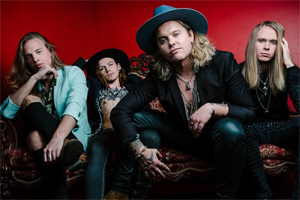 "The 'Cruz 4' project – from doing demos in Finland, to the Las Vegas studio sessions with Kane, to the audition and rehearsal period in Hollywood – has been an amazing journey,” says Archie. “I am super-exited to continue the journey and hit the road with Pav, Ero and Toxy. The band is sounding amazing and better than ever, and we will hit the festivals like a hurricane." More information about SANTA CRUZ's new album will be revealed in the coming weeks.